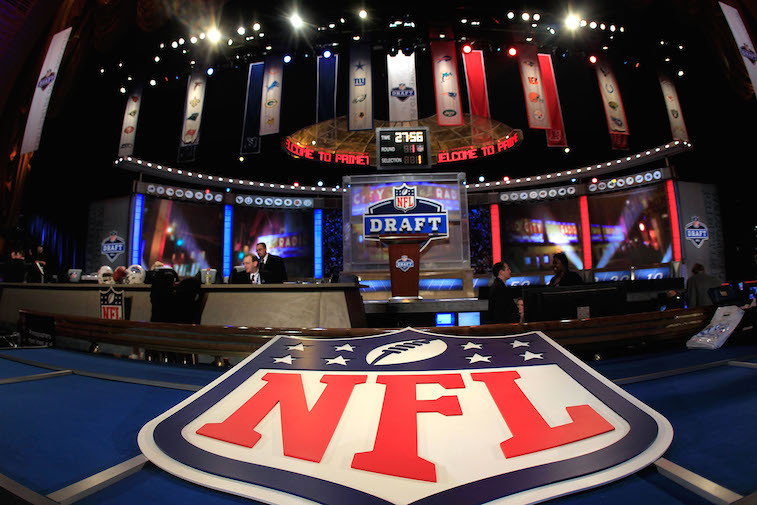 After months of workouts and seemingly endless amounts of speculation, the 2015 NFL Draft is finally upon us. The first round of the draft will open tonight at 8 p.m. EST, and as usual, the rumor mill has been running wild for a couple of months. Most of the draft-related rumors that have been floating around this offseason are nothing more than smoke screens that teams have put on Draft Day. Of course, there are also rumors that will prove to be true. Thanks to social media and smartphones, it has become extremely difficult for teams to keep everything in-house. NFL insiders such as Adam Schefter and Jason La Canfora will almost surely be providing up-to-the minute updates on potential trades and other rumors all day long on their Twitter accounts, and surprisingly enough, a lot of what they report will turn out to be true. With the 2015 NFL Draft only hours away, we decided to put together an in-depth list of the five biggest rumors that are currently hovering around the league. Here’s a look at what we found. Mariota’s representatives believe that there are as many as five teams that are seriously interested in trading up to select the 2014 Heisman Trophy winner. 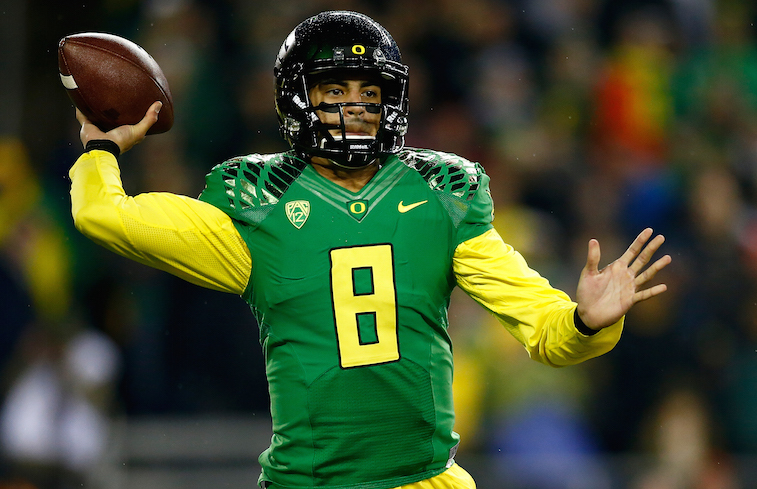 Most people around the league now believe that Mariota will likely go No. 2 overall to either the Tennessee Titans, who currently own the pick, or to one of the teams that are said to be willing to pay the heavy price to move up. The five teams linked to the former Oregon Duck over the past couple of days are the Cleveland Browns, the Philadelphia Eagles, the San Diego Chargers, the St. Louis Rams, and the New York Jets. Reports surfaced Wednesday that the Browns have offered the Titans two first-round picks in exchange for the No. 2 overall pick, but Cleveland will have to significantly sweeten the pot for a deal to get done. If the Browns aren’t able to swing a trade with Tennessee, the next most likely candidates would be the Eagles or the Chargers. Philadelphia head coach Chip Kelly is said to be doing everything he can to reunite with Mariota, but he simply may not have the assets to do so without completely selling the farm. The Chargers would likely have to part ways with veteran quarterback Philip Rivers as well as multiple draft picks in order to pull off a trade of this magnitude. Only time will tell where Mariota falls in the draft, but this is a rumor that won’t die down until Roger Goodell calls Mariota’s name tonight. 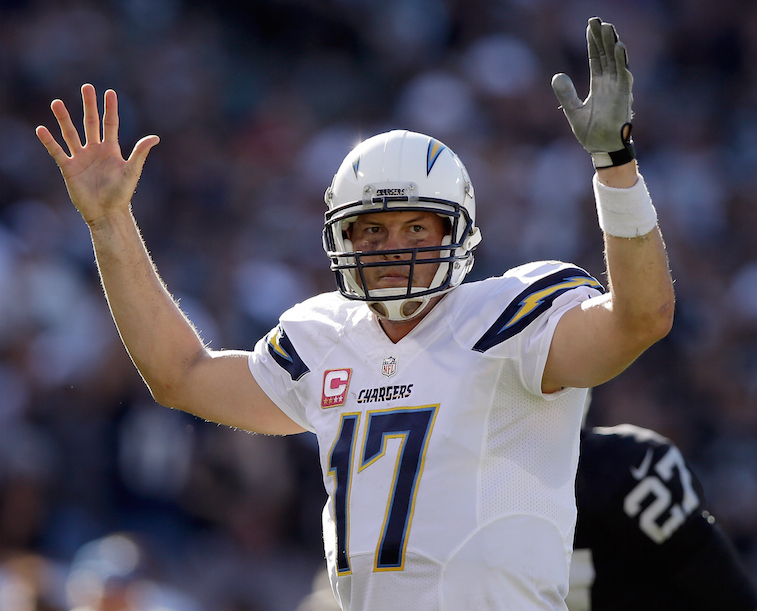 Rumor has it that Rivers has informed the Chargers he has no interest in signing a contract extension with the team, meaning that the 33-year-old quarterback would be an unrestricted free agent following the 2015 season. Instead of letting Rivers walk without receiving any kind of compensation, the Chargers are now rumored to be shopping the five-time Pro Bowler. As it turns out, the Chargers and Rivers are currently in the midst of ongoing contract discussions, and most insiders around the league believe any trade proposal involving Rivers is as good as dead at this point in time. Among the teams rumored to be looking to trade down to accumulate additional draft picks are the Oakland Raiders, Washington Redskins, and Minnesota Vikings. The Raiders are said to have their sights set on either landing USC defensive lineman Leonard Williams or Alabama wide receiver Amari Cooper, but they may ultimately decide that stockpiling picks is their best option as they continue to rebuild the franchise. New Redskins General Manager Scot McCloughan has gone on record saying that he has a goal of turning the seven picks he currently has into at least 10 picks. The best way to do that would be to aggressively shop the team’s No. 5 overall pick to teams looking to move up. 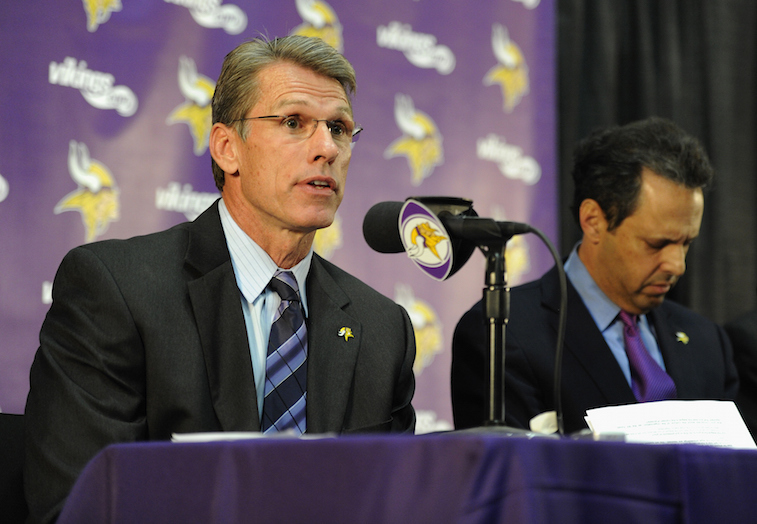 In similar fashion to the Redskins, the Vikings have also made it no secret that they are looking to trade down and are hoping to come away with a double-digit number of picks in this year’s draft. Gurley recently underwent a medical re-check on his surgically repaired ACL and came away with good news. His knee checked out well, and doctors now believe that the 6-foot-1, 222-pound running back will be ready in time for training camp. This news has resulted in Gurley quickly shooting up the draft boards of several teams around the league. 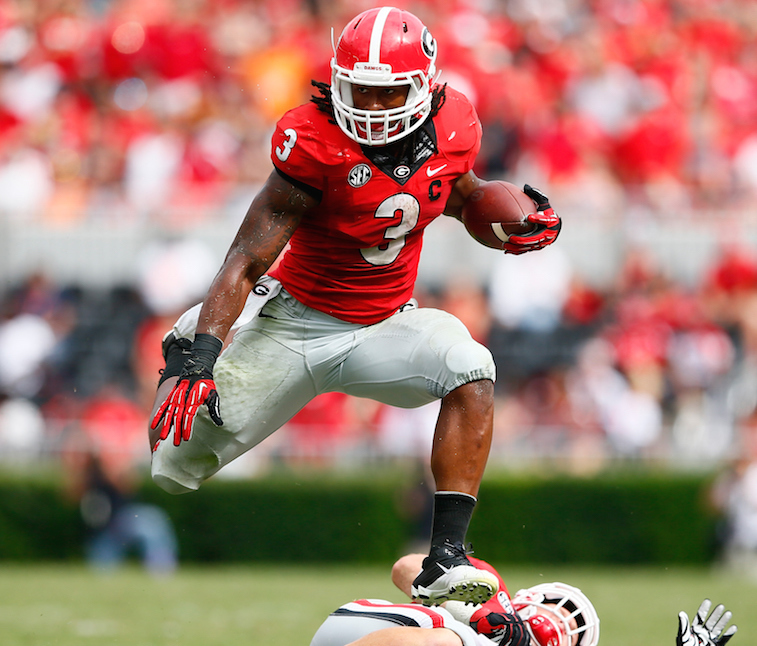 In fact, one team is said to have ranked Gurley as the No. 1 player on its board heading into the first round tonight. Aside from the aforementioned teams that are in the mix to trade up and land Marcus Mariota, there are a handful of teams — the Atlanta Falcons, New Orleans Saints, Denver Broncos — that are rumored to be looking into trading up in the first round tonight. The Falcons currently hold the No. 8 overall pick and have reportedly been calling around to try and move up. Their target is unknown, but General Manager Thomas Dimitroff has proven that he is willing to be extremely aggressive on Draft Day if he has his sights set on a certain player. The Saints have the benefit of having two first-round draft picks at their disposal, which could be enough firepower for them to move up and go after an explosive wide receiver like Kevin White or DeVante Parker. 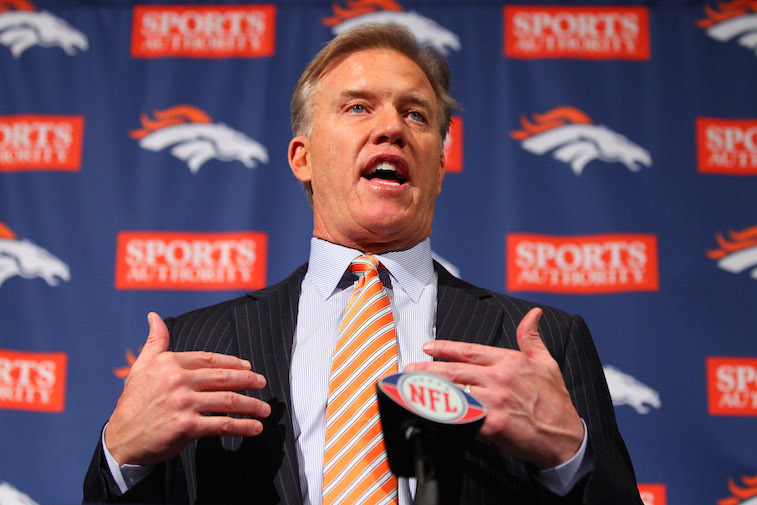 The Broncos are out to find a starting-caliber offensive lineman, and if there is a guy John Elway really wants, there is a good chance that Broncos general manager will do whatever it takes to land him.